Warning! This is going to be a long installment of CD Scavenger Hunt. I actually started the hunt last week when I read that Ted Nugent and Joe Lynn Turner were having pre-orders for the U.S. release of their new albums and Melodicrock.com was taking pre-orders for their 10th Anniversary CD. Joe Lynn Turner – Second Hand Life (2007) – $13 pre-order: Joe Lynn Turner’s new album was already released this past April for Europe and Japan so I’m a few months behind. SECOND HAND LIFE is officially released today (August 28) in the U.S. with a nice surprise of two bonus tracks: ‘Two Lights’ from the European version and ‘Off The Hook’ from the Japanese import. 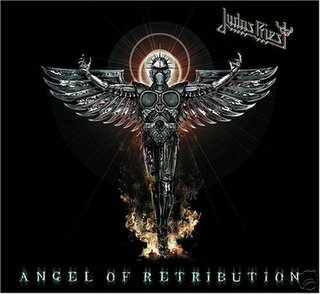 Just to make it worthwhile, JLT also decided to add a new song, ‘Freedom’s Wings’, in for good measure. Instead of 11 songs, you get 13, including all the bonus tracks for $13. I ordered this CD last Thursday and it was in my mailbox Monday. The price breakdown was: $11 CD + $2 shipping = $13. Ted Nugent – Love Grenade (2007) – $20.50 pre-order: Ted Nugent also has a new album coming on September 4 and his online store also had a pre-order. No bonus tracks on this one but the artwork is limited edition for pre-orders only. I figured I’d order it same day as JLT and I’d have it before the release date. So far nothing yet. The only thing I don’t like about this pre-order is the high shipping ($7.50). Price breakdown: $13 CD + $7.50 shipping = $20.50. MelodicRock.com Volume 4 – Melodic Still Rocks (1997-2007) – $20 pre-order: Andrew McNeice at Melodicrock.com has always had an excellent website and I am proud to have been a daily reader since 1998. The site has really grown into an industry force and is an excellent source of information on all genres of AOR, Hard Rock, and Heavy Metal. Andrew has put out three superb compilations featuring Melodic Rock acts and many unreleased songs. I already have the first three volumes so Vol. 4 was always a definite. You get two discs with 17 songs each featuring songs that have already been released, are bonus tracks, or are unreleased and used exclusively for this album. Pre-ordering also gets you a special link to a download page with 7 more exclusive bonus tracks. 41 songs for $20…..I’ll take it! Price breakdown for the U.S.: $17 CD + $3 shipping = $20. This CD is officially released September 10, the pre-order is still going and their are still copies of Volumes 2 & 3 available with discount pricing. Today was New Release Tuesday and I had the kids in the car for the 10am store openings because I still had birthday money to spend. Best Buy was first…..
Scorpions – Humanity Hour 1 (2007) – $8 (Best Buy exclusive): Advertised for $7.99 in the Sunday newspaper and includes an exclusive bonus track, ‘Cold’. A must have! Like JLT, this CD has been out for a few months around the world but I never got to buying it, I’m glad I waited. When I went to Newbury Comics five minutes later, this CD was $2 more and didn’t have ‘Cold’. Heaven & Hell – Live From Radio City Music Hall DVD (2007) – $12: Another must have and $3 cheaper than Newbury Comics. I caught the tour in May and it was a really solid show. Newbury Comics (my favorite record store) was next….. Heaven & Hell – Live From Radio City Music Hall (2 CD) (2007) – $15: If you have the DVD, why not buy the CD as well? Rhino Records could have made life easier by making the pre-order for the limited edition box set available earlier but I’m not going to complain. I got both sets $40 cheaper than the box set pre-order price. Queensryche – Sign Of The Time (The Best Of Queensryche) 2 CD set (2007) – $20: I’m a sucker for bonus tracks and, even though CD 1 is basically a carbon copy of 2000’s GREATEST HITS, I still snagged the limited edition package. 32 songs for $20…..the completist in me had to have it and technically it was a birthday gift. Black Majesty – Tomorrowland (2007) – $12: I’ve heard one or two Black Majesty tunes so I’ve had them on my list for awhile. Couldn’t pass up the price especially since the other four copies didn’t have a sale tag and were $16.99 regular price! 3 Inches Of Blood – Fire Up The Blades (2007) – $14: Another band I’ve been wanting to check out for some time now. I’ve heard a few songs and read some good reviews but I also made this purchase on the high recommendation from Rene, who really enjoys this column. Thanks Rene! It sounds fantastic. Vains Of Jenna – Lit Up/Let Down (2006) – $13: Another band I’ve been meaning to check out…..see a trend here? I’ve read great reviews from trusted websites so I’ve been looking forward to this album. The problem has been price…..it’s never been in local stores so the online pricing ranges from $17-$22 depending on where you surf. $13 is a bargain! House Of Lords – World Upside Down (2007) – $10: I’ve been waiting for a U.S. release on this CD for about a year now because the import prices are too high, about the same as the Vains Of Jenna record. WORLD UPSIDE DOWN was originally released in 2006 on Frontiers Records but this U.S. release is licenced by Locomotive Records, who seem to be getting more and more of these European released titles for the States. Can’t beat 10 bucks! House Of Lords – Live In The U.K. (2007) – $10: If you’re going to buy the latest studio album, why not buy the new live album at the same time? At 10 bucks you can’t beat that! This was also released earlier (January 2007) on Frontiers Records and is now licenced to Locomotive Records. Megadeth – United Abominations (2007) – $10 used: I missed the sale price when this came out earlier this year but I kept it on the want list, especially after I saw the band open up for Heaven & Hell in May. Finding this CD used was a great find. A very lucrative week for my collection…..I crossed more than a few new albums off my want list at decent prices. Columbia Records Announces the Release Of AC/DC’s ‘Plug Me In,’ the Ultimate Career-Spanning DVD Boxed Set of Live Performances & More from the World’s Most Electrifying Rock & Roll Band. NEW YORK — Columbia Records will release Plug Me In — the ultimate career-spanning DVD box set of live performances, interviews and more from AC/DC, the world’s most electrifying rock & roll band — on Tuesday, October 16. The first AC/DC release since the band came to Columbia Records earlier this year, the AC/DC Plug Me In DVD collection brings together for the very first time an astonishing five hours of definitive live concert and television performances — many of them previously unavailable — chronicling the on- going career (now in its fourth decade!) of a groundbreaking rock & roll powerhouse whose music transcends the test of time. Disc One of the AC/DC Plug Me In DVD collection begins with a performance of “High Voltage” performed in October 1975 on Australia’s “King of Pop Awards” show. The first disc of Plug Me In is devoted to the band’s formative years (1975-1979) with original lead singer, the late Bon Scott capturing the group in its full early glory with more than 20 performances including rare black & white video footage of the notorious St. Albans High School concert on March 3, 1976; the very first UK television appearance in July 1976; pristine live full-color stereo concert performances from Glasgow and Essex University in 1978; and three songs — including the very first public performance of “Highway To Hell” — from Netherlands television in 1979. Bonus material on Disc One includes a Bon Scott interview from November 1977; extraordinary band interviews from 1976; and four songs recorded live in Nice on December 15, 1979, one of Bon Scott’s last concerts with the band before his tragic death on February 19, 1980. Disc Two of the AC/DC Plug Me In DVD collection covers the band’s second great epoch: the Brian Johnson era which began with the release of “Back In Black” in 1980 and continues to this day. In addition to more than 20 performances drawn from three decades of concerts around the world — including an extremely rare Japanese television appearance from February 1981, blistering 80s and 90s sets from Detroit to Moscow, incredible footage from 1996’s “Ballbreaker” tour (including the “Beavis & Butthead” intro), and 21st century barnburners in Paris, Munich, and Toronto — Plug Me In includes a fantastic array of bonus material including the AC/DC Donnington interview on the “Old Grey Whistle Test” (August 1984) and AC/DC’s in-concert performance of “Rock Me Baby” with the Rolling Stones. A deluxe collector’s edition of Plug Me In — containing a third DVD of 21 additional rare performances spanning both the Bon Scot and Brian Johnson eras as well as a treasure trove of facsimile reproductions of authentic AC/DC memorabilia — will also be available for a limited time beginning Tuesday, October 16. The AC/DC Plug Me In DVD box set is both a Holy Grail for aficionados of AC/DC as well as an ideal and comprehensive introduction to the music and history of a pioneering band that continues to define the electrifying possibilities of rock & roll. Formed in Sydney, Australia in 1973 by brothers Angus and Malcolm Young (still the most formidable electric guitar team in rock), AC/DC released its first album, “High Voltage,” in 1975. The group has gone on to sell nearly 70 million albums in the U.S. alone, making AC/DC one of the five best-selling bands in American music history. The “Back In Black” album has achieved RIAA “Double Diamond” status, for sales in excess of 21 million copies in the United States, and is the U.S.’s fifth largest-selling album ever. AC/DC was inducted into the Rock & Roll Hall of Fame in 2003. 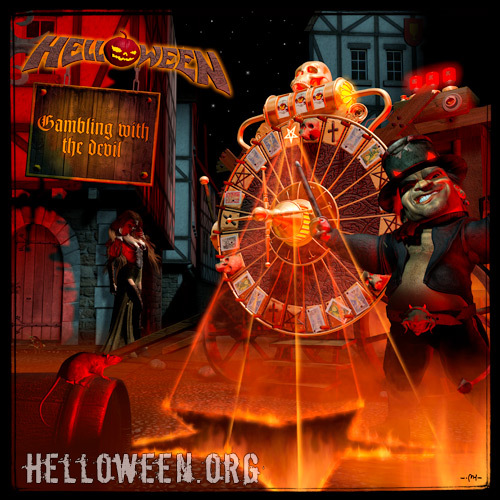 Helloween will release their new album, GAMBLING WITH THE DEVIL, on October 31st…..Happy Helloween! The new album’s artwork is below…..I’ll post more details on this release as they come in. Danger Danger – s/t (1989): Something about late ’80s Hard Rock still sounds fresh. Danger Danger came on the scene late but still managed a solid debut. Torch – Fireraiser E.P. (1982): Only five songs on this debut but a nice trip to Metal’s past. Loud and fast from Sweden. Thunder – Giving The Game Away (1999): Not the hardest rocking album from Thunder, who also came in towards the end of the ’80s. A solid band with a solid back catalog. Frehley’s Comet – s/t (1987): A good debut by the Ace. I remember buying this the day it came out, I still get excited listening to this album. Van Halen – VH III (1998): It’s still not Gary Cherone’s fault. Def Leppard – High ‘n’ Dry (1981): Still can’t get the show from two weeks ago out of my head. This record is a classic. Westworld – s/t (1998): Tony Harnell (from TNT), Bruno Ravel (from Danger Danger), and the great Mark Reale (from Riot) form to create an album of superb Melodic Hard Rock. A lost classic from the late ’90s. KISS – Lick It Up (1983): Gotta have my daily dose of my favorite band. Scorpions – Eye II Eye (1999): If you saw this tour, then you know that these songs are much better live. There are good songs here, especially the ballads, you just have to get by some of the samples and beats. 3436 songs (288 full albums) – Still haven’t used half the memory. I saw this record way back in 1984 at Good Vibrations when I was twelve years old. I remember this was in the “New Release” rack and I thought the cover was so cool. I mean, who comes up with these album cover concepts anyway? Anytime a 12 year old kid sees a good looking woman on an album cover, they want it! I was no exception. Of course, now the cheese factor is obvious. I looked for a cassette copy but they only had vinyl and I didn’t own a turntable. The next trip to the store and it was gone, never to be seen until….. In ’98, when I finally got a computer and Internet access, I found this album again. I was researching Torch and I found that Metal Blade Records had released the band’s first two albums [TORCH E.P. (1982) & TORCH (1983)] on CD but not ELECTRIKISS. I’ve been lucky to find these two CDs in used bins for under five dollars. Fortunately, ELECTRIKISS is easily found on Ebay all the time. I started collecting hard to find vinyl recently but I always pass by this album, maybe because it’s always available online. As of this post, there are at least five vinyl copies to be had under $20. I haven’t picked this up yet because I still don’t have a turntable. 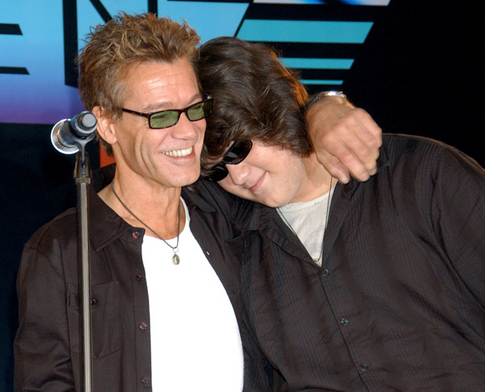 I was glued to VH-1 Classic at 2:45pm Monday to see the big Van Halen press conference. Maybe it was the thrill of seeing Diamond Dave being Diamond Dave. Maybe it was the anticipation that this could blow up before it starts. Or maybe it was finally seeing what I never got to see in 1984 at age 12…..the original Van Halen! Everyone must know by now that Michael Anthony is out and Eddie’s son, Wolfgang Van Halen, is in. So it’s not the original band. I could probably live with that. 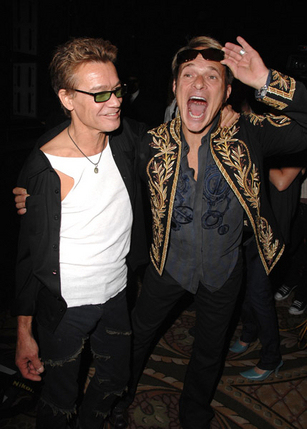 In the fifteen minutes they had on stage, David Lee Roth commanded the audience that gathered. He did 90% of the talking, he did 90% of the boasting, and he did 100% of the performing. You could just tell that he was eating it up knowing that he had thumbed his nose at the critics again and was going to get a huge payday when it’s all said and done. I love DLR so I’m all for him playing in Van Halen and basking in the glory. I can live with that. 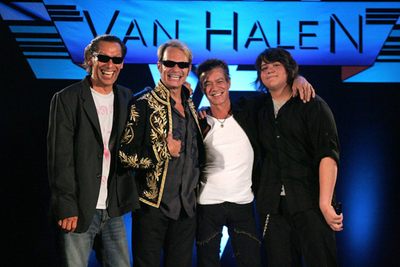 Eddie Van Halen goes on to say that the band is now BETTER than it was in the past and how this is going to continue. The band was plainly asked why Michael Anthony is not involved and they skirted around the answer by praising Wolfgang’s talent at sixteen years old. All respect due to Wolfgang but there is no way he’s better than Mike Anthony! And later it’s revealed that they are probably going to use pre-recorded backing tapes to compensate for the backing vocals when they could have Mike at the mic. I’d have a hard time swallowing it but, if it means seeing Dave live with Van Halen, I could learn to live with it. Today I started looking for the onsale dates and ticket prices for the Boston, MA show…..October 30 but no prices. The first show in Charlotte is fetching $125, $75, and $55. The last tour with Hagar stopped at the Worcester Centrum (outside Boston) and commanded a range of $75 up to $150. That’s a bit expensive but I could charge it and pay the bill later, I can live with it. Of course, my concert search leads me to Van-Halen.com. That’s when I see the disturbing thing: the albums covers for VAN HALEN I and WOMEN AND CHILDREN FIRST have been changed to wipe out Michael Anthony’s image! The debut has Wolfgang where Mike should be and WOMEN has only the background color and titles, no picture. It’s like they are trying to erase the past! 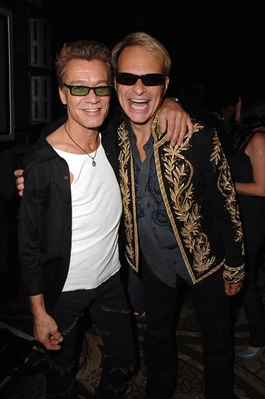 Idolator.com has a post on this with pictures of VAN HALEN I. This I can’t live with! It’s one thing to replace a member and it’s one thing to not like a guy but to try to erase him from the band’s history is just not right. The fans have been all over this on message boards and mailing lists all over the Net. I belong to a few newsgroups and this was the hot topic in my inbox today. What is the common denominator here? Alex? He does what his brother tells him. Say what you want about his guitar playing but it’s obvious he’s brought Van Halen down from the top where Metallica, Aerosmith, and Bon Jovi live right down to the bottom. I’ve made my decision…..I’m not giving them my money. As much as I’d like to see this concert, it just seems shady. I’m sure the shows will be great. I’m sure DLR and Eddie will enrapture an audience that will be half diehards and half casual fans, most in attendance won’t even realize Michael Anthony is missing. I’ll wait for the DVD! Nothing is better than dragging the kids out at 9am to go to Target, Wal-Mart, and Best Buy. That’s what it takes nowadays if you’re a diehard KISS fan and you want all that bonus material. Why? Because Gene & Paul have brainwashed us into thinking that we want it all. So, like the diehard I am, I had both my girls dressed and fed so we could enjoy what they call “KISS Day”. KISSology 2 DVD (2007) – $22: Target is the first to open up on the strip and it’s also the farthest away, maybe an extra two blocks! The bonus disc available at Target was the one avaiable at the majority of retail outlets: Budokan Hall in Tokyo, Japan 4/21/88 Crazy Nights Tour. I could have gotten this version anywhere but the price was right and there was another purchase to be made…..
Madden 08 (2007, Playstation 2) – $50: I’m a big NFL Football junkie and a video game freak so this is a must buy every year. The fact that Madden is released the week of my birthday every year makes it a great gift from my girls. Actually, my oldest daughter who is 8, has only ever known giving me a Madden football game for my birthday. They brought me to the game, picked it out, and asked if I still wanted it because it was “KISS Day”. Maybe Gene & Paul aren’t the only ones brainwashing? This KISS fan cannot live with only one bonus disc so the next stop was two blocks down and across the street to the most evil store in the United States…..Wal-Mart. I’m a Union worker and representative so shopping at Wal-Mart defies principles but I couldn’t wait until their exclusive bonus disc hit Ebay! KISSology 2 DVD (2007) – $25: The highest price of all three visits but the exclusive bonus disc of the Dynasty Tour from Largo, MD in ’79 was a must. Somewhere I sensed Gene was smiling….. Wait! There’s one more version of KISSology 2 to be had! One block down and across the street again to Best Buy where they don’t open until 10am. We park at 9:50 and get out to join the crowd of twenty people at the door. Everyone there was for the Madden game except one guy in a KISS t-shirt that saw mine and gave me the thumbs up! Comraderie at it’s finest! KISSology 2 DVD (2007) – $22: Another store, another bonus disc. This time it’s another Crazy Nights Tour stop: The Ritz in New York 8/13/88. Played three days before my 16th birthday in ’88…..but I wasn’t there! I saw this tour in Providence on 12/12/87 for $16.50 w/Ted Nugent…..Crazy Nights era KISS is important to me, LOL! Highlight of this purchase was my 3 yr. old pushing through the door and running ahead yelling, “Where’s my Daddy’s KISS DVD?”. It was a proud moment. As I paid for my 3rd KISSology 2 in an hour, I sensed Gene & Paul laughing as dollar signs flew over their heads….. The list was complete: all three versions of KISSology 2 and Madden o8 for Playstation 2…..but we are only two blocks away from the record store I shop at! Off to Newbury Comics to spend my last $30 of birthday loot! Y&T – Live: One Hot Night CD/2 DVD set – $20: I usually get to the record store early to get the only copy of things like this but it’s 10:10am and someone might have bought it already, especially for a bargain twenty bucks. It had just come out of the delivery box when we walked in the store, it hadn’t even settled on the shelf before I had it at the register. With all the KISS and Madden I’ll expose myself to in the next 24 hours, Y&T will be a nice diversion. This is an easy review to write because this is basically an album of unreleased demos. Flashback to 1983 and the band is named Roxx Regime. In an attempt to get a record deal, the band puts together a demo tape and is subsequently signed to a deal with Enigma Records. Once the deal was ready to sign, the band changed their name to Stryper and the rest is history! 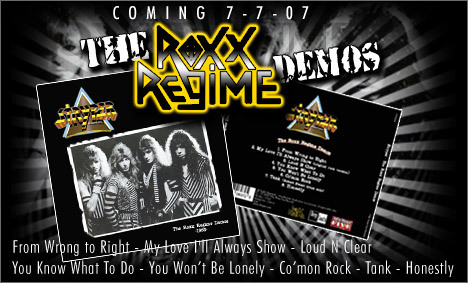 This is supposedly the original demo with no overdubs and/or re-recordings. What you get on this disc is a band that is very polished and energetic for a new set of rockers. The quality of the recordings are raw and harder than their commercially released counterparts. It’s pretty good for a demo, very listenable. Five of the first six songs (‘My Love I’ll Always Show’ being the exception), ended up on the original E.P., THE YELLOW AND BLACK ATTACK (1984). That E.P., along with ‘My Love I’ll Always Show’, and a new song called ‘Reason For The Season’, were re-released as a full album under the same name in 1986 on Hollywood Records after their second album, SOLDIERS UNDER COMMAND (1985) went gold in the U.S. This version of ‘Honestly’ pre-dates the 1986 version from TO HELL WITH THE DEVIL and it is of poor quality. It could just be the recording because this is damn close to the album version, including the harmonies. The drum solo by Robert Sweet, ‘Tank’, is a throwaway…..I never consider Robert Sweet when the conversation turns to great drummers and I’m not going to start now. Plus, it’s only 44 seconds long! So what’s the point? 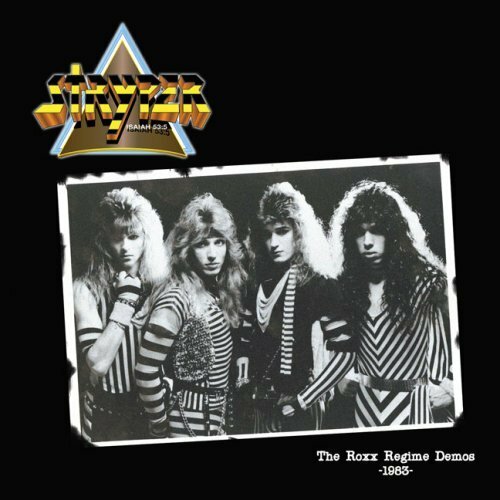 If you want to hear the earliest Stryper recordings, then pick it up. If you want to hear the proper recordings, buy THE YELLOW AND BLACK ATTACK and TO HELL WITH THE DEVIL. For collectors and completists only…..and at a cheap price, mine was $9.99! I went to the Def Leppard/Styx/Foreigner show last night at the Tweeter Center in Mansfield, MA. I was flying solo again because all of my friends have “retired” from the concert scene, they only go to the “important” shows (KISS, Ozzy, Maiden, Priest, etc). Their loss is my gain because it’s always easier to get a good seat when you are only buying one. I had 10th row for the show so I was really looking forward to it. The Tweeter Center is an outdoor arena with 10,000 seats under the roof, a seated lawn, and a grass lawn. Capacity is around 18,000-20,000 so it’s a decent size. It’s a good place to see a concert and I have seen many over the years. It’s also about 15 minutes from home so that helps. Usually when there are three bands on the bill, the seated area under the roof is sparse for the opener. It was packed for Foreigner…..
Let me tell you, Mick Jones looks OLD! I was on his side of the stage and he just looked his age, he can still play though! Jason Bonham was behind the drum kit and Jeff Pilson (ex-Dokken) was on bass. Obviously a tight rhythm section. The highlight of the performance was lead singer Kelly Hansen (ex-Hurricane). Kelly performed each song extremely well and sounded very close to the great Lou Gramm at times. The band played to a packed house and didn’t disappoint. Best song of the set: ‘Dirty White Boy’…..but they were really great live so all the songs were tops, I’d see them if they came headlining. Styx only got 45 mins and I was a little disappointed, I was hoping they would play at least an hour. With Foreigner on promptly at 7:00pm and a 25 minute set change between bands, Styx got the short end of the stick. What they lacked in time, they made up in performance. Lawrence Gowan (vocals/keyboards) really shined on ‘Grand Illusion’ and ‘Come Sail Away’ and sounds very much like former singer Dennis DeYoung. James Young got on the mic for ‘Miss America’ and the rest were for Tommy Shaw, who has become a driving force in the post-DeYoung era. Best song of the set: ‘Fooling Yourself’…..but, like Foreigner, all the songs were great live. Aside from the time constraints, the only problem I had with the performance was Gowan’s antics. He dances, he prances, he turns the keyboard around and plays with his back to the crowd, he seemed down right silly at times on stage. But he had energy and that may be what a classic band like Styx needed when he joined in 1999. Sixteen songs in 90 mins, not a bad setlist. Anytime you can get two songs from HIGH ‘N’ DRY (1981) and ‘Mirror, Mirror’ was a total surprise. Now imagine my plight: I’m alone surrounded by screaming women of all ages. There is one guy next to me and he is obviously only there for his girlfriend. The first four songs roll by, every woman in the place is going bananas and then Def Lep does two songs that weren’t MTV anthems. I’m going nuts, singing word for word, and all these ladies are asking “Is this a new song?”…..I love “diehard” fans! Nothing would please me more if the band came back next year and played non-hits from the first three albums or play EUPHORIA (1999) or X (2002) in their entirety. The band played well but Joe Elliot’s voice isn’t what it used to be. At times he struggled but he did get better as the night wore on. If they had gone two hours, he would have sounded great. I also noticed that Joe’s gotten a bit larger over the years…..haven’t we all? Seriously, I think the Leps get a bad rap for their commercial side but they really played well, with a ton of energy, and they sounded great. My only complaint was that they didn’t do the same encore as last year. Actually, there was no encore this year, they quickly ran off, changed guitars and played ‘Rock Of Ages’. If they stayed true to their M.O., they should have played ‘Pour Some Sugar On Me’ to end the show…..and I could have gotten a head start to the car! Nothing is worse than ‘Sugar’, especially with every woman, casual fan, and non-fan singing the words. If I had to hear another woman say she wanted <insert band member here> to pour sugar on her, I would have killed! Best song of the set: ‘Mirror, Mirror’ & ‘Another Hit And Run’. I’ve been getting a lot of email with requests for audio samples of the new Peter Criss album, ONE FOR ALL (2007). Unfortunately, I’m not that technically inclined…..yet. Thanks to YouTube, someone called ToxicVideo created some homemade videos for three songs from the new album. Enjoy! Rock writer Ray Van Horn Jr. noticed that his blog (Pulses, Verses and Other Flotsam) received more participation from readers when the articles were about Metal. Armed with that info, Ray decided to change the name to The Metal Minute and stay focused on the harder side of Music. Sounds good to me, I was a regular reader anyway but the readers that prefer Metal should check this site out right away. The link is in the sidebar.